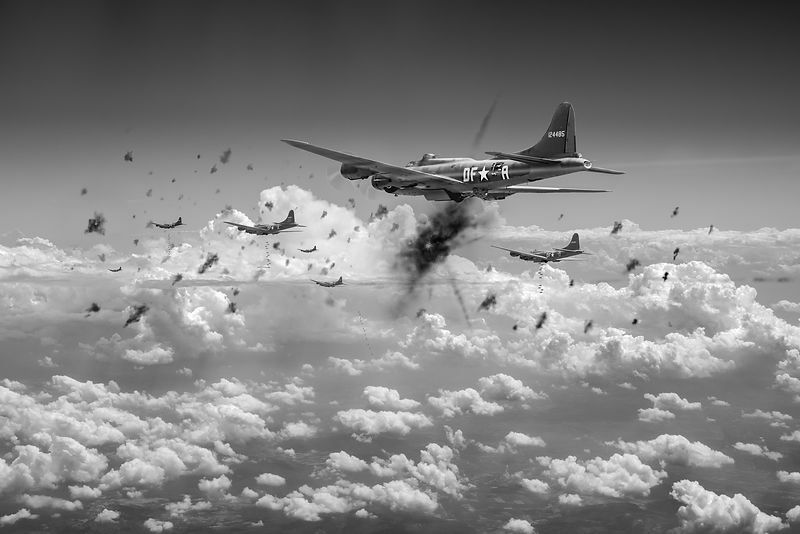 American B-17 Flying Fortresses taking flak on a daylight bombing operation over occupied France in late 1942. These aircraft are from the 91st Bomb Group of the US Army Air Corps VIII Bomber Command. In the foreground is perhaps the most famous B-17 of them all, a B-17F, USAAC Serial No. 41-24485, unit code DF-A and better known as Memphis Belle. It achieved fame as one of the first to complete 25 combat missions with crew intact: they were decorated and flew home and went on a morale-raising publicity tour of the United States.